SoftBank's Pepper robot will be available to consumers on June 20. You Can Buy an Emotional Robot to Live at Your House. Want One? 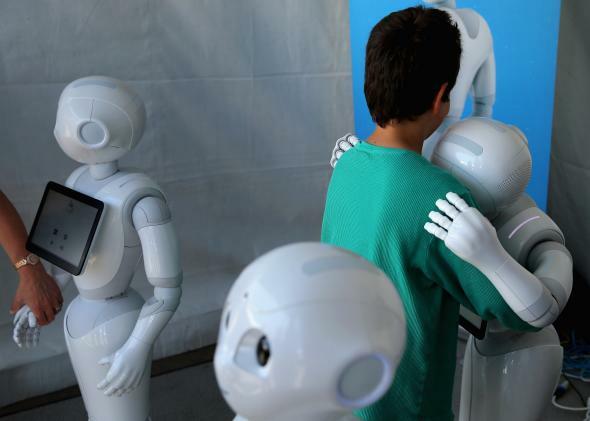 Peppers giving out hugs at DARPA’s Robotics Challenge Expo on June 6. Whether robots are coming for your job or not, marketers want them in your home. Personal assistants and family robots are already on the market, and now you can even buy an emotional humanoid. Beginning on Saturday, Japanese telecom SoftBank will begin selling its Pepper robot for 198,000 yen (about $1,600). Pepper first debuted last year and was developed by robotics group Aldebaran. The robot interacts with humans verbally but is also meant to put people at ease in a more subtle way. Pepper can also mirror emotions and even express its own—like loneliness if you don’t interact with it. This emotional awareness is meant to make Pepper a better companion, because it is supposed to be fluent in the subtle forms of human communication. Bloomberg Business reports that SoftBank will market a version of Pepper to businesses starting this fall. Peppers are also available to rent for 1,500 yen (about $12) per hour. Japanese bank Mizuho Financial Group has already said that it will put Peppers in some of its stores and branches. And this isn’t just a fringe project. Forbes reports that Alibaba and Foxconn are each investing 14.5 billion yen (about $118 million each) in SoftBank’s robotics division. Robot emotions are still just simulations of human feelings. But at least robot roommates don’t leave dishes in the sink or lose the remote.